The meetings for discussing the environmental impact assessment of the Ruse-Veliko Tarnovo highway start at 28th of November in Pavlikeni, Gorna Oryahovitsa, Veliko Tarnovo and Polski Trambesh. The road will include four protected areas and will be close to industrial, residential buildings and agricultural land that is used for cereal, fruits and vegetables growing. The report about the environmental impact assessment of the investment preposition for the Ruse-Veliko Tarnovo highway is published on the internet page of the agency for road infra-structure. The public discussion of this report will be done between 28th of November and 1st of December 2017. There will be 10 meetings in the towns and villages where the road will be passing through. On the 28th of November is the discussion in the municipalities Pavlikeni, Gorna Oryahovitsa and Veliko Tarnovo. On the 29th of November are the meetings in Polski Trambesh, Tsenovo and Byala. On the 30th of November the report will be discussed with the people from the municipalities Borovo, Dve Mogili and Ivanovo and the last meeting is in Ruse on the 1st of December. The report is prepared by Dango Proekt Consult and they offered three options for this highway – blue, red and combined. The experts recommend the combined option because it’s more environmental friendly. During the construction 3848 properties with total size of 11 725 000 sqm will be affected, of which 695 000 sqm agricultural land and 48 000 sqm fruit garden. 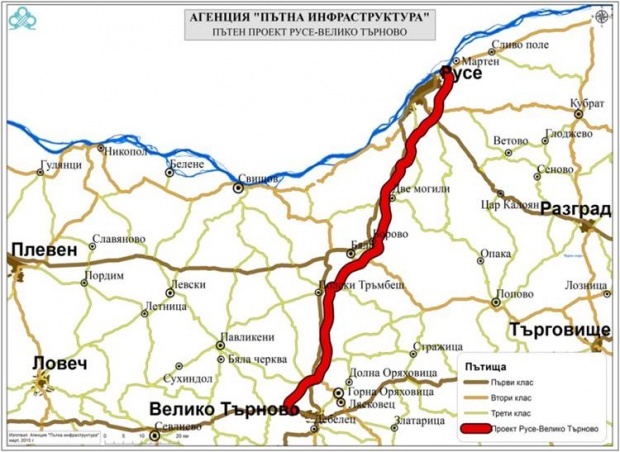 The Ruse-Veliko Tarnovo highway will be approximately 133 km. long and the beginning of the project will be 3 km east of Danube Bridge next to Ruse and the end will be after the town of Debelets direction to road II-55. In these three options for roads have been explored the options for building the highway through a new terrain outside the existing road I-5. The project is divided in three parts: Ruse – Byala, around Byala and Byala – Veliko Tarnovo. The project includes 22 bridges with total length of 15 km. Building this highway is a priority because this is the main road for the transit traffic by the corridor №IX and the international road Е85. With this future highway the inner and the international traffic will be improved, the safety also will be improved and the transit traffic will be taken out of the settlements. 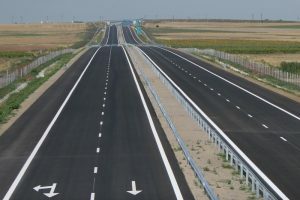 The Ruse-Veliko Tarnovo highway will be main connection from Veliko Tarnovo to the Danube Bridge next to ruse and also will be connected with the roads 4 Sofia-Veliko Tarnovo-Varna and the future part of Hemus highway.